ox-hugo is an Org exporter backend that exports Org to Hugo-compatible Markdown (Blackfriday) and also generates the front-matter (in TOML or YAML format). The ox-hugo backend extends from a parent backend ox-blackfriday.el. The latter is the one that primarily does the Blackfriday-friendly Markdown content generation. The main job of ox-hugo is to generate the front-matter for each exported content file, and then append that generated Markdown to it. There are, though, few functions that ox-hugo.el overrides over those by ox-blackfriday.el. See the Real World Examples section to quickly jump to sites generated using ox-hugo and their Org sources. Before you read further, you can see below how ox-hugo translates Org to Markdown (Org on the left; exported Markdown with Hugo front-matter on the right). The preferred way to organize the posts is as Org subtrees (also the main reason to write this package, as nothing like that was out there) as it makes the meta-data management for Hugo front-matter pretty effortless. If you are a one Org-file per post type of a person, that flow works too! Just note that in this flow many of those #+hugo_ properties need to be managed manually.. just as one would manage the front-matter in Markdown files — See the Org versions in the above screenshots for comparison. The test site uses a minimal theme written just for debug purposes (not extra aesthetics). The test site is designed to verify if all the content translates from Org to Markdown as expected. See Hugo Themes for examples of really good site prettification and presentation styles. This package requires emacs 24.4+ and Org 9.0+. It is available on Melpa (https://melpa.org/#/ox-hugo). Once the package is installed, you will need to require it so that the ox-hugo export options are available in the Org Export Dispatcher menu (the one you see when you hit C-c C-e to initiate any export). Also see the Auto Exporting section. You do have have to use the use-package version when using Spacemacs. That version was used because use-package is installed by default in Spacemacs. If you do so, you also need to add ox-hugo to dotspacemacs-additional-packages. The default Hugo section name for all the posts. See here for more information on Hugo sections. It is common for this property to be set to posts or blog. The default value is set using org-hugo-default-section-directory. See Hugo Section for details. Important: If you choose to export an Org subtree as a post, you need to set the EXPORT_FILE_NAME subtree property. That property is used by this package to figure out where the current post starts. If point is in a valid Hugo post subtree, export that subtree to a Hugo post in Markdown. A valid Hugo post subtree is an Org subtree that has the EXPORT_FILE_NAME property set. If the file is intended to be exported as a whole (i.e. 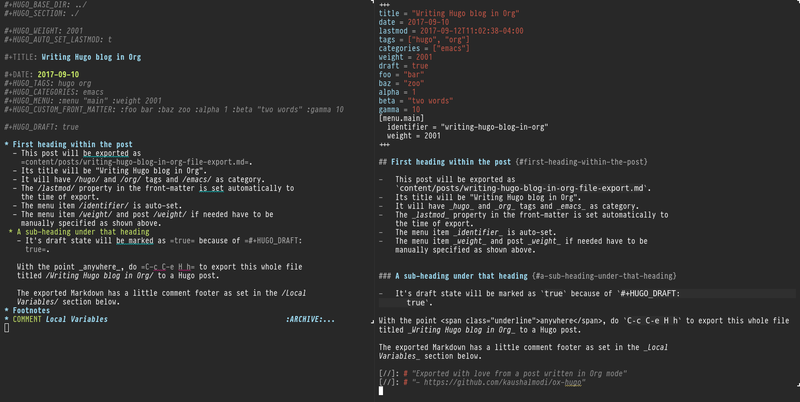 has the #+title keyword), export the whole Org file to a Hugo post in Markdown. If the Org file has one or more ‘valid Hugo post subtrees’, export them to Hugo posts in Markdown. If the file is intended to be exported as a whole (i.e. no ‘valid Hugo post subtrees’ at all, and has the #+title keyword), export the whole Org file to a Hugo post in Markdown. Export the Org file to a Hugo post in Markdown. Do M-x customize-group, and select org-export-hugo to see the available customization options for this package. Also thanks to http://whyarethingsthewaytheyare.com/setting-up-the-blog/ (not hyperlinking the link as it is insecure — not https), http://www.holgerschurig.de/en/emacs-blog-from-org-to-hugo/ (not hyperlinking the link as it is insecure — not https) and the goorgeous project by Chase Adams (@chaseadamsio) for inspiration to start this project.